High Light Reflective: Interior Mylar material reflect 95% light and zip design blocks all light from escaping. Strong Structure: Thick 600D canvas is tear proof and dis-mountable iron pole keep the tent steady with smooth installation and safe handling. Build the most suitable living environment for your cherished plants and take good care of them simply by taking Coolgrows Home Use Dismountable Hydroponic Plant Growing Tent with Window back home! Effectively resisting any intense sunlight from shining on the plants, this tent could help to extend the lifespan of plants. Its high-strength materials as well as delicate workmanship ensure good durability and solid structure. This tent is also designed with a window. 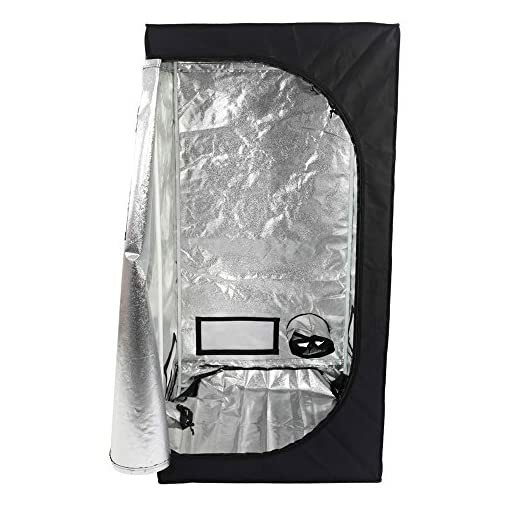 Such a room-saving and lightweight plant growing tent is worthy of purchasing! Easy access and full enclosed: Zipper works smoothly with high quality and No light leaks to help plant grow quickly. Complete grow tent with easy installation: This portable tents are easy to install with detachable pole and No tools needed.